Hello everyone and Feliz día de Reyes! I am back in Barcelona after an absolutely wonderful week in Las Palmas. I have been disconnecting 100%, with no internet & no blogs for days and it has been quite refreshing. Now I am back though, and ready to tell you about this day, that is quite so special in Spain. 6th of January is like our Christmas Eve in Norway. The 24th December in Norway is when we give presents, but here in Spain they wait until 6th January, since it's not Santa Clause bringing the presents but the Three Holy Kings. Melchior, Gaspar, and Balthazar, representing Europe, Arabia, and Africa, arrived on horse, camel and elephant, bringing respectively gold, frankincense and myrrh to the baby Jesus. Children (and many adults) polish and leave their shoes ready for the Kings' presents before they go to bed on the eve of January 5. The next morning presents will appear under their shoes. 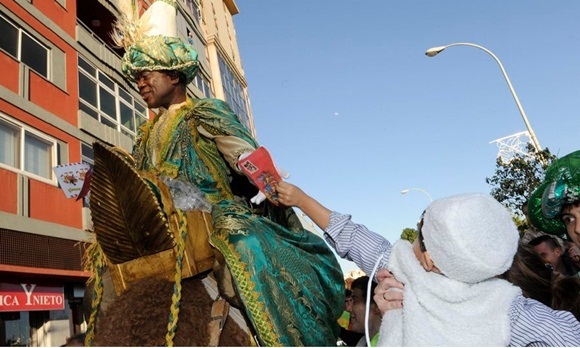 Most towns in Spain arrange colorful parades representing the arrival of the Reyes Magos to town so children can see them in their camels or carriages before they go to bed. 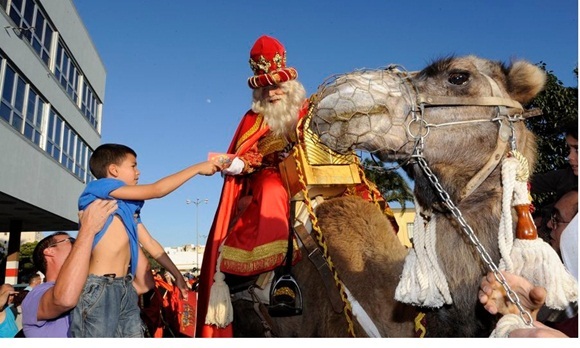 Sweet wine, nibbles, fruit and milk are left for the Kings and their camels. In Spain children typically receive presents on this day, rather than on Christmas. 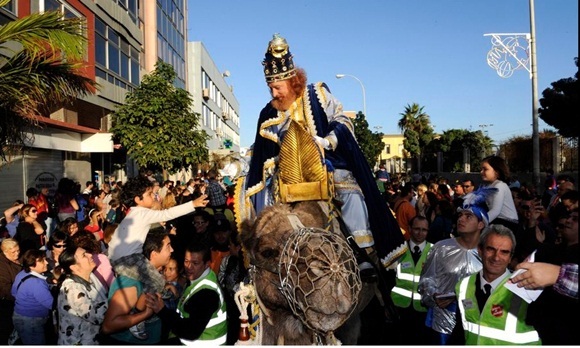 In Las Palmas, as many other cities there is a big parade each year on the 5th January. I didn't have my camera with me, but I have borrowed photos from the local newspaper, by Arcadio Suarez.. It has been fun to see the Spanish way! Now I will unpack my stuff and then I promise to tell more about my holidays and New years and all of it over the next few days. Wish you all a wonderful evening! It must be absolutely amazing to be part of that crowd at the parade. I hope you get settled back in nicely and then plan your next adventure! That is pretty cool - you kind of got two Christmases! I had no idea how different it was there. Thanks for sharing! It was fun to experience two sorts of Christmases! To me, at 6th January Christmas and Christmas spirit is long gone, but it was still fun to experience. valencia,madrid,zaragoza are wonderful places. The fiesta,food,and people.